Come and learn and enjoy the Afro-Brazilian rhythms of the Blocos Afro from Salvador, Bahia. For children and families who are resident in Waltham Forest (children under 8 years must be accompanied by an adult). Beginners Welcome. Drums are provided. FREE workshops but booking essential. These workshops form part of Mbilla Arts’ Think Globally, Create Locally project. 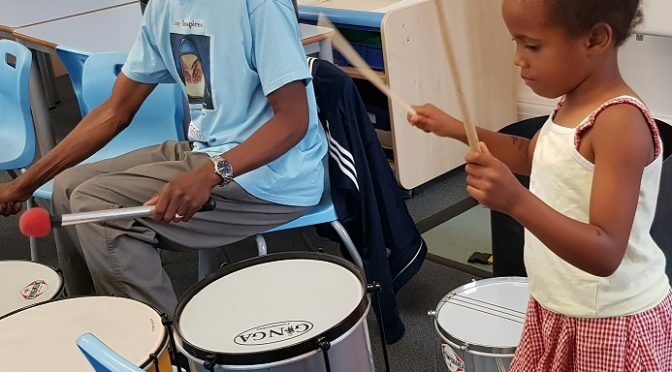 The project is funded by Waltham Forest’s London Borough of Culture Fellowship Funding and is delivered in partnership with Organiclea Community Growers Cooperative and Hornbeam Learning Lodge. The project culminates in a celebration day at Organiclea’s Hawkwood Nursery site in Chingford on Sunday 30th June 12-3pm.